Risk management is essential for safe and efficient pharmaceutical and biopharmaceutical manufacturing, control, and distribution. With this book as their guide, readers involved in all facets of drug manufacturing have a single, expertly written, and organized resource to guide them through all facets of risk management and analysis. It sets forth a solid foundation in risk management concepts and then explains how these concepts are applied to drug manufacturing. 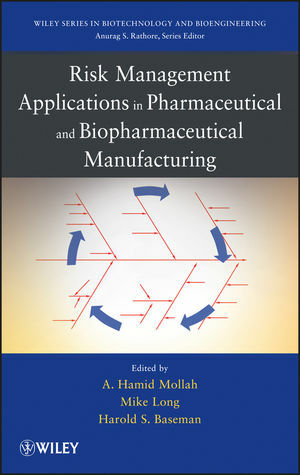 With its unique focus on the application of risk management to biopharmaceutical and pharmaceutical manufacturing, this book is an essential resource for pharmaceutical and process engineers as well as safety and compliance professionals involved in drug manufacturing. A. HAMID MOLLAH, PhD, is the Head of Quality Engineering and Validation at XOMA. He has also held positions at Genentech and Baxter. He is a RAPS Certified Regulatory Affairs Professional and ASQ Certified Quality Engineer. Dr. MIKE LONG, has two decades of experience leading product, process development, and validation efforts on a wide range of pharmaceutical, medical device, and combination products. He is a frequent speaker and writer on topics such as risk management, quality systems, quality by design, and process validation. HAROLD S. BASEMAN, MBA, Principal and Chief Operating Officer, ValSource LLC, has more than thirty years of experience in pharmaceutical operations, validation, and regulatory compliance. He has held positions in executive management and technical operations at several manufacturing and consulting firms.